Airing Tuesdays 9:30pm on the Nine Network. Rated M.
We’re in the tail end of The Bible now, and Nine gave us a double episode of Jesus’ life and teaching. In fact the first of the two episodes, Mission, seemed very much like a road movie, as Jesus went from town to town teaching people and healing the sick. This episode kicked off with Jesus teaching about the kingdom of God and the famous healing of the skylight-creating paralytic. It’s a powerful moment as the teachers of the law look on in confusion, stating ‘only God can forgive sins’. Yep! You’re looking at him. Peter once again reminds us that ‘this is just the beginning.’ It’s a fitting statement for an episode which packs in stacks of Jesus’ life and mission. One of my favourite scenes of this episode was Jesus telling the parable of the Pharisee and the tax collector, but to them. You’ve got this crowd watching on and Matthew looks up with tears welling in his eyes, and mouths the words ‘have mercy on me, a sinner,’ as Jesus speaks them. Soon enough the crowds cotton on that Jesus is someone special. There’s chanting (something this series does often) of ‘ME-SSI-AH! ME-SSI-AH!’, and they’re swarming around him. Soon enough Jesus is walking on water amongst some bad CGI, and Peter recognises who Jesus is. There are big things going on in this episode and I think the producers have handled the Scriptures fairly well. 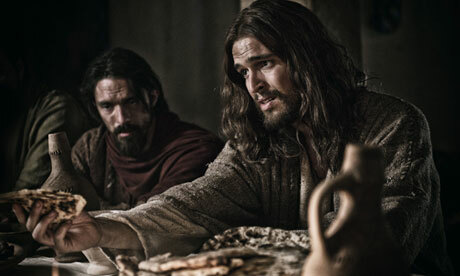 On show is sin and the hypocrisy of the Pharisees who are just astounded at Jesus’ claims. They heckle him. They say his work is of demons. Overarching Mission, the question ‘Is this the Messiah?’ is speculated. Jesus reads from Isaiah and shows us that all the episodes to this point – even the OT ones – are pointed to him. Now people are discovering for themselves who Jesus is – and then coming to the point of trusting him or rejecting him. This episode is structured in the week leading up to Passover, or, Jesus’ death. The crowds are still good at chanting. ‘ME-SSI-AH!’ and ‘IS-RA-EL!’ are shouted while Jesus enters Jerusalem on the back of a donkey. It’s a familiar scene with palm fronds being waved around. But despite the cheerful crowds, we cut to the chief priests and elders who are upset. We see their aggression and fear. Soon enough Jesus is walking up the steps of the temple (complete with an overhead shot containing awful CGI) and he gets upset that people are using it as a market. Jesus gets upset – not as angry as we might have expected – and the priests rebuke him, stating ‘We teach the law. Not you.’ Their eyes are so closed to the truth. Promos this week claimed we’d see ‘the ultimate betrayal’ and in many ways we did. Judas enters and the whole episode changes emotional skew to being quite sombre and foreboding. It’s a stark contrast to Mission. The closer it gets to passover, the tenser it gets in Jerusalem. Jesus quietly teaches about how to be born again, and how the Spirit will dwell. He and the disciples share in the last supper – not at a fancy table like the famous painting makes out, but actually in a home setting. But the producers whip past this and don’t make a huge deal about the fulfilment of prophecy here, which is a shame. Jesus goes to the garden to pray: is betrayed, and is ready to be put to trial and charged for blasphemy. These episodes are starkly different to each other. I felt as though in trying to make Betrayal more dramatic and emotional, the writers forgot to keep playing out the story in the way it has been – fulfilling the law and the promises – even Mission was all about uncovering Jesus’ identity. The exciting stuff is shown in those who see Jesus for who he is. The crowds chanting, Peter’s following (although he will soon deny Jesus), and even the fear of the Pharisees who feel threatened by Jesus. It’s worth turning to Scripture to see the importance of what Jesus is preparing to do. After singing psalms, they went out to the Mount of Olives. There is so much emotion and anguish here but the new covenant is about to begin and it will all result in the forgiveness of sins for those who trust in him. Investigating who Jesus is is a great thing to do. If you haven’t done that yet, I encourage you to spend some time reading the book of Mark or the other Gospels to see whether what you’re seeing each Tuesday night on TV matches up with what Jesus claims in the Bible. Tonight we’ll see the blood poured out on the cross, and see that it’s a reminder of the new covenant we share in, and the forgiveness of sins that is given to us by God’s grace. Posted in TV ShowsTagged Bible, christian, God, Jerusalem, Jesus, Nine Network, Peter, The Bible, The Bible TV Series, TV ReviewBookmark the permalink.